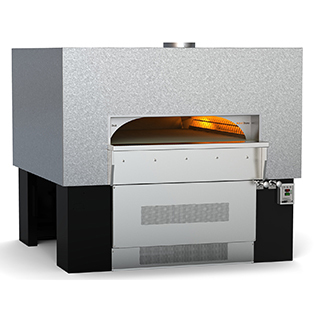 The Fire Deck 6045 oven features a door opening 34 inches wide x 9.75 inches high, complemented by a glass heat shield and stainless steel mantle. The cooking area is 42 inches wide x 31 inches deep, resulting in a 9-square-foot cooking surface. A tensioned steel exoskeleton surrounding the hearth and dome perimeter ensures structural integrity and longevity. Wrapped in spun ceramic fiber insulation and requiring only a 1-inch side clearance to combustibles, the monolithic 4-inch thick cast-ceramic hearth and monolithic 4-inch thick dome rest on a black painted steel stand. The oven body front is finished with stainless steel; galvanized steel is used for the top, back and sides.